Facebook Free Video calling lets you make calls right from Facebook without downloading any additional programs or plugins, and works with Google Chrome, Firefox and Opera. All you need to do is click in the upper-right corner of a conversation to start a video call. In our previous post, we learn on how to make a Video Call on Mobile Phone. 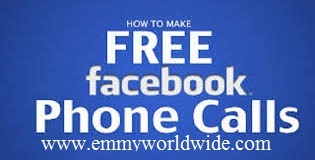 Today, we will learn how to Enjoy Facebook Free Video calling Via Mobile Phone and PC, which is working very perfectly. You need a compatible mobile phone that accept facebook messenger, download and install it. Once install, login with your facebook username and password, all your facebook friends will automatically come up. If your facebook friends did not come up, just synchronize your facebook messenger. 3. If your friend is currently online and will be able to receive a video call, the will be green out, and you'll see a message that says "[Your Friend Name] is currently available for video calling." But If your friend isn't currently able to receive a video call the will be grayed out, and you'll see a message that says "[Your Friend Name] is currently unavailable for video calling." Note: You and your friend need to set up cameras and microphones of your device, so that you'll be able to see and hear each other in real time. You can mute or disable your camera at any time to switch to a voice-only call. You can continue using chat and other Facebook features during your video call i.e Multi-tasking. Call records: The time and date of each call you make is listed in your ongoing message history with each friend. The calls themselves are not recorded or saved. Which browsers support video calling? As at the time of publishing this post, video calling works with Mozilla Firefox, Google Chrome and Opera. Make sure you're using a supported browser, and that your camera and microphone are set up correctly. You can also Enjoy Free Video Calls To All Networks, if your phone is 3G enable phone.